How can you save the Amazon? Award winning (current British all Winners drama festival winners) drama group Pump House CYT are presenting a world premiere, high quality, multimedia production that can deliver a life changing environmental message. Using art is an accessible way to deliver important environmental messages, with young people at its core, mentored by an internationally renowned green campaigner and involvement of indigenous Indian this project is well positioned to change the lives of all that it touches. Pump House CYT, Phil Williams (Plan-it Eco), Warner Bros, Verde Business Solutions and Sani Lodge have formed a partnership to write and develop an original production regarding the plight of the indigenous Indians in the middle of the Ecuadorian Amazon Rainforest and how they cope with pollution, deforestation from the oil industry and illegal loggers. 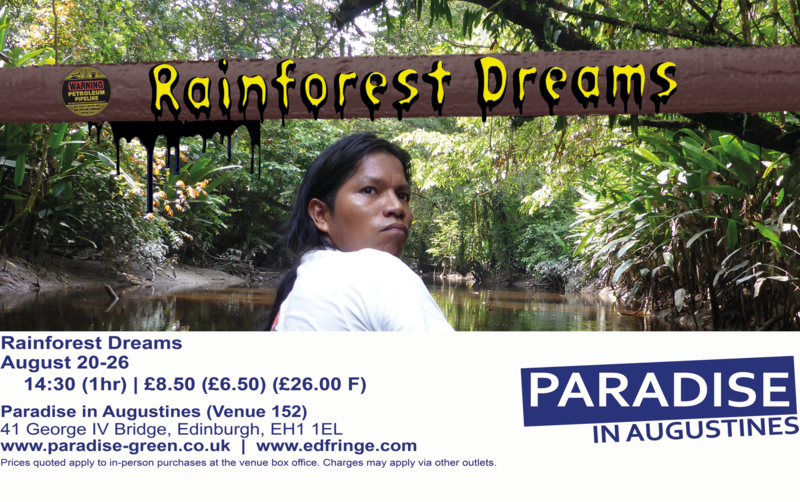 The result is Rainforest Dreams by Phil Williams, adapted and additional material by Sharon Gaffney and Karen Rhodes. This multimedia, original production highlights the plight of the indigenous Indians in the middle of the Ecuadorian Amazon Rainforest and how they cope with pollution, deforestation from the oil industry and illegal loggers. lives in the Amazon Rainforest. This gripping piece of theatre shows direct insight into the devastating effect of the oil corporation’s toxic waste on the indigenous people. If you discovered dangerous evidence, what would you do? Remember, what happens in the rainforest AFFECTS US ALL!